The Royal Navy's Type 42 destroyer HMS Gloucester has been assisting the British Antarctic Survey (BAS) in South Georgia, to assess the effects of climate change. 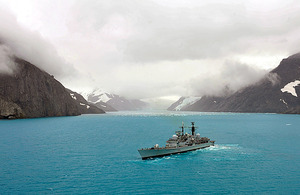 The ‘Fighting G’ is nearing the end of a seven-month deployment to the South Atlantic and made her way through the turquoise waters of Drygalski Fjord to the BAS on South Georgia after rounding off her Falklands patrol. The ship deployed her Lynx helicopter to help their conservation work by taking aerial photographic surveys of eight glaciers which will allow the BAS to compare these with previous images and determine if the glaciers are retreating and at what rate. In South Georgia this is particularly important for the millions of ground nesting birds as the glaciers are the only thing preventing rats from stealing their eggs and threatening their survival. HMS Gloucester’s visit came at the height of the southern summer which meant that the sailors were also treated to visits from inquisitive fur seal pups and penguins on the island. The photos were absolutely brilliant. I can’t emphasise enough how important this information is to the management of the island and it isn’t something we could have easily achieved without HMS Gloucester’s assistance. The ship’s company also helped to bring stores and equipment to the island and moved the BAS around their different satellite stations. To go to such a place is an immense privilege. For sailors, it is something unusual and of low-intensity but it reminds us that there are other things. Things that are worth striving or fighting for come in many shapes and sizes, and one of them is that this wonderful haven should be conserved, which, in this day and age, is being managed by people like the British Antarctic Survey and the South Georgia Government. The Type 42 destroyers are equipped with the Sea Dart medium-range air defence missile system which, in its primary role, is designed to provide area air defence to a group of ships, although it is also effective against surface targets at sea. In addition to their role as an air defence platform the Type 42 destroyers operate independently, carrying out patrol and boarding operations. The present HMS Gloucester was one of the last four of the class to be built. They have a lengthened hull design giving better seakeeping qualities and greater endurance. The ship was built by Vosper Thornycroft at Woolston in Southampton and was launched on 2 November 1982 by Her Royal Highness The Duchess of Gloucester. The ship retains links with the Rifles regiment and the city of Gloucester. The ship’s crest features a horseshoe, part of the city’s Tudor Arms. The ships motto is ‘Prorsum’ which means ‘Onwards’.